A year ago, I started researching yoga as a therapy technique for my complex PTSD. I checked out videos from the library and asked friends online for suggestions. That led me to Yoga With Adriene. Over the summer months, I began using yoga in a very limited way, mostly focused on certain poses when I was started dissociating. Only in the fall did I try to start with a regular yoga practice, choosing Adriene’s 30 days of yoga program from Jan 2015. Though of course I then managed to sprain my foot and ankle right after finishing my day two workout. Boo. As 2016 began, I decided to follow along with Adriene’s 30-day Yoga Camp, going from January 2nd to 31st. I did well…until day 5. The previous evening, there had been a little family emergency that took several days to deal with. Yoga stopped being a priority. When I could finally work on it again, I resigned myself to starting over from the beginning, really wanting to hit it 30 days in a row. Then I thought, you know what? I have three teen boys and an absolutely crazy schedule. It’s not going to happen! And rather than keep on starting over from Day 1, I’m just going to keep going forward. It is possible for me to increase my flexibility. Slowly. A little. I’ve never been flexible, not when I was tiny and athletic and doing every kind of exercise and stretch known to man. But by the end of these three months, I can get my heels all the way down during downward dog on some days, and I can reach past my toes almost to my wrists, and I can hug my legs to my chest, and I can open my legs past a 90-degree angle – none of which I could do at the beginning. My foot, now seven months post-sprain, is still healing. I had to modify certain poses to accommodate it, and certainly can’t balance well on that leg. Warrior I with that foot turned out? Yowch. However, the Camp has been helping me to build strength, balance, and flexibility back into that foot, and along with my therapy exercises, it is getting so much better! I will do child’s post as extended child’s pose 99% of the time, and I don’t feel the slightest bit guilty for “breaking” the rules. Wide knees, belly dropped between them, arms above my head and cradling my elbows (see above pic). 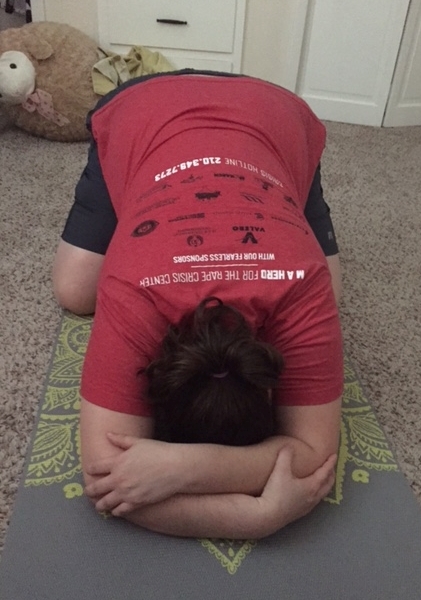 This is my go-to PTSD safety pose, and it calms me every time. My back and neck feel about a thousand times better when I do yoga. It gets all the kinks out, and my muscles grow looser but stronger, allowing me to get the kinks out on my own outside of practice. Both my husband and my chiropractor have noticed a change in my back and neck muscles, as well as in how self-adjusting my body has become through yoga. I am a strong person. Yes, I may weigh over 200 lbs, but I have a ton of muscle. There was very little in the workouts that I couldn’t do, beyond what would have stressed my injured ankle. Total confidence builder. The Camp had daily mantras. The mantra from Day 26 struck me in particular: I attract ___. (fill in the blank) At first, I had no idea what to say. Health? Love? Good words for my manuscript-in-progress? An agent and a book deal? (ha!) But then it struck me, and just felt right: I attract READERS. Yes! Yoga is so much better in a semi-dark, cool room wearing nothing but light pjs (or less if no one is home!). I have loved doing this Yoga Camp, and don’t plan to stop yoga any time soon. I hope to keep it as part of my life several times a week, and maybe this fall, I’ll get back to that original 30 Days of Yoga from 2015 that I had to abandon this past year! The rest of my extensive blood work came back. Most of what it said came as no surprise, though I did find out I’m extremely low on vitamin D despite being in the sun (without sunscreen – don’t lecture me, there’s a medical reason for this!) quite often. I’ve started a supplement for it, and also now have specific dietary requirements tailored to my health and genetics per this test. Follow up in six months with another extensive blood test. Point being that my doctors are really getting down to the causes of the medical problems from the last year, and are (hopefully) helping to put me on the path to healing. This entry was posted in Wellness and tagged fitness, health, Wellness Wednesday. Bookmark the permalink. Okay. I do love yoga. Are you going to continue with Adriene or are you going to find other online classes? That is SO wonderful that your doctor is so determined to find root causes for your health issues. I have to switch doctors soon thanks to changing healthcare, and I am always nervous about finding a new doctor. I definitely think I’ll mostly continue with Adriene. She has a lot of really good videos out and I’d like to experience her classes. They’re very freeing without a lot of American-hokey in them, heheh. You (and a couple others) convinced me and I tried Adriene today. It was a beginner “little things make a big difference” type title. I liked her! I love my out-of-house yoga instructor but can’t seem to find the time to make it there recently. I think I’ll start one of Adriene’s programs tomorrow. I already felt better today just from the 20 minutes of yoga. She is such a great instructor – so fun to listen to, and so nonjudgmental! It’s awesome.